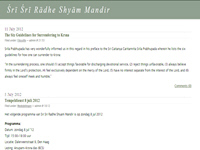 The website of Sri Sri Radhe Shyama Mandir in Hague. It contains articles on many spiritual topics, Vaishnava calendar updates, etc. Category Netherland July 12, 2012 by ISKCON Desire Tree.